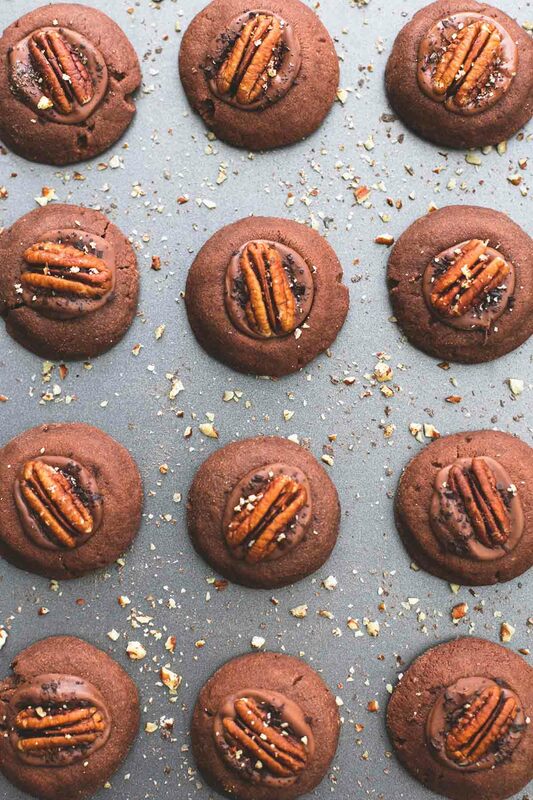 Soft and chewy turtle thumbprint cookies with a melty chocolate and caramel pecan-topped center. 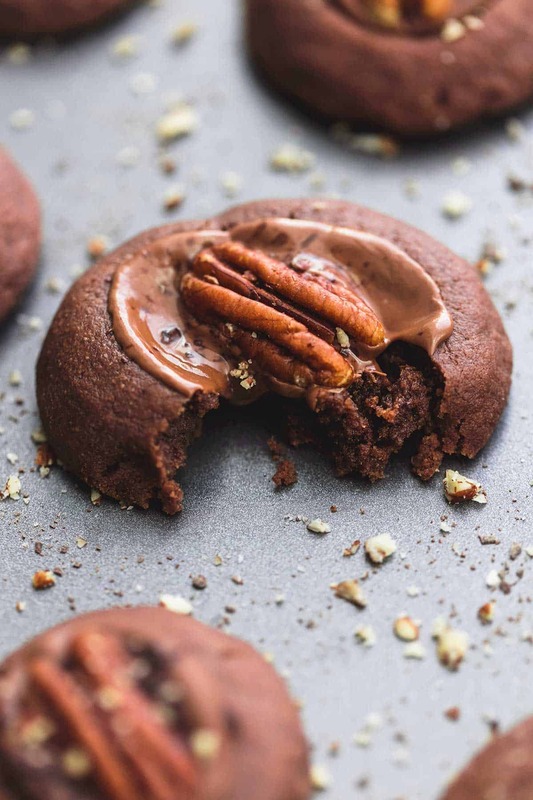 I’ve made an overabundance of these perfectly fudgy little cookies over the past few weeks but the truth is that they’re just as tasty every other time of year, promise. Holiday or not, whatever your need, whatever the occasion, these babies are the answer. Now it’s up to you but I recommend erring on the lesser end of baking time. 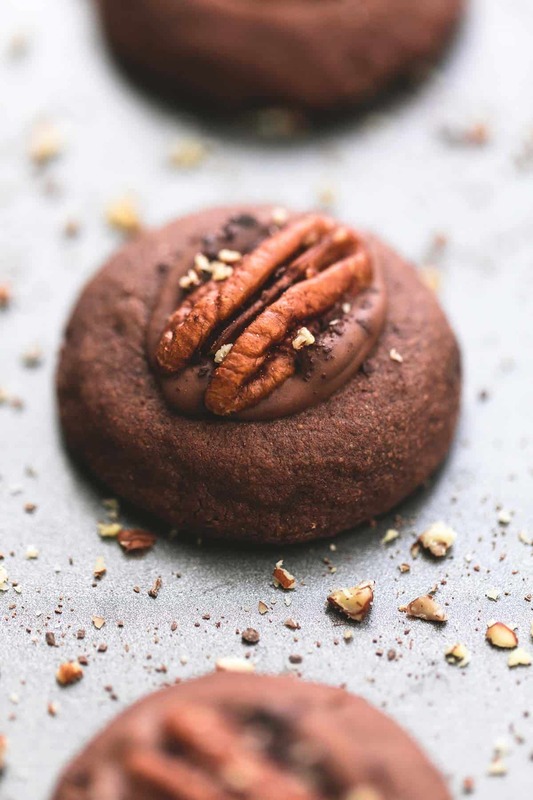 I think these yummy little chocolate thumbprint cookies are especially delightful when they have a softer, chewier, brownie-like texture. Also, did I mention these cookies involve Rolos? 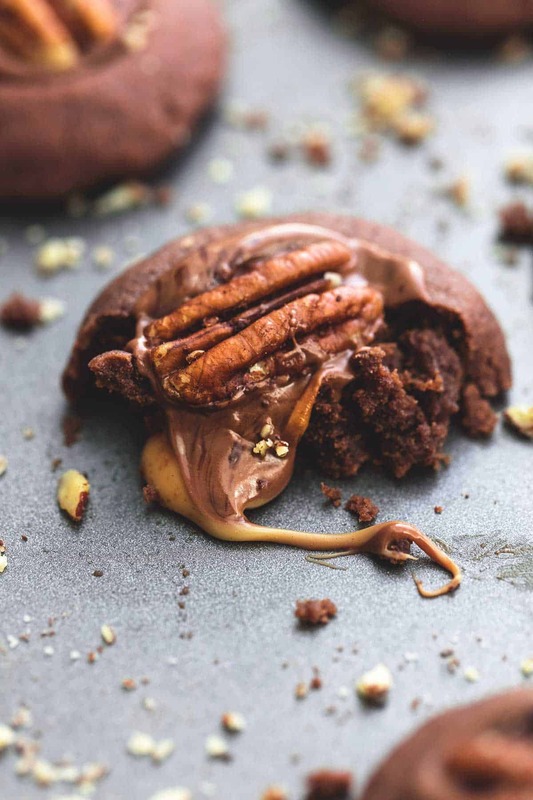 I absolutely love Rolos, whether they are simply unwrapped and popped straight into my mouth, or half-melted in the center of a chocolatey cookie and topped with a pecan. Preheat oven to 350 degrees and lightly grease a baking sheet. In a large bowl cream together butter and sugar. Mix in cocoa powder and milk. In a medium bowl whisk together flour, salt, baking powder, and baking soda. Add dry ingredients to wet ingredients and mix until incorporated. Roll dough into small balls (about 1 1/2-2 inches wide) and place on prepared baking sheet. Use your thumb to press down in the centers of the balls to make an indent. Bake for 7-9 minutes until cookies look dry and start to crack a bit around the top. (I prefer to under cook mine a little bit so they stay very soft and chewy) Gently press down the centers again. Immediately place a Rolo in the center of each cookie. Return pan to oven for about 1 minute. Remove from oven and immediately place a pecan on the top of each Rolo and press down firmly so the melty Rolo squishes out around the pecan. Serve immediately or allow to cool completely and store at room temperature in airtight container up to 3-4 days. hey girl- these look so good! This beauty must be added to the baking list ! Happy holidays to all !